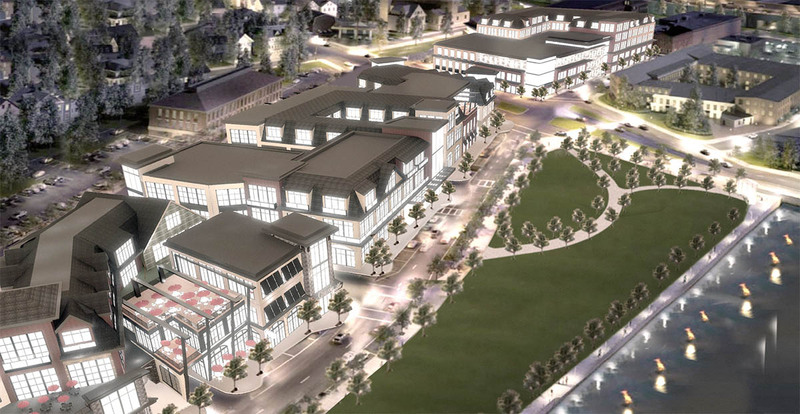 The Carpionato Group was scheduled to present a proposal for 195 District Parcels 2, 5, and 6 to the 195 Commission this evening dubbed “The Row at College Hill”, that meeting has been postponed. There’s a lot to unpack in this large proposal. It covers 3 parcels on the east side of the Providence River between South Main and South Water Streets stretching from James Street at the northern end to Peck Street, one block south of Wickenden. 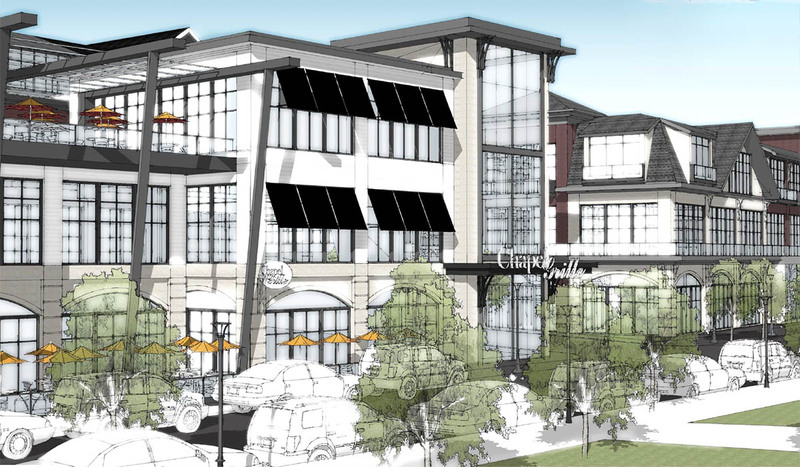 The proposal calls for 4 buildings across the 3 parcels with 74,600 square feet of retail, 203,500 square feet of office space, 124,950 square feet of residential space (104 units), a 30,000 square foot restaurant (which seems kookoo bananas large! ), and a 48,400 square foot hotel (+/- 70 rooms). The proposal also calls for 640 structured parking spaces. Seriously, I can’t take any of this seriously when they are proposing a 30,000 square foot restaurant. That has to be a misprint. The rumor-mill has been whispering about a Target here, but I don’t see how there is enough room for that on any of the parcels or in the buildings as proposed. Maybe an urban concept Target? I’m not holding my breath. The plans do call out a “market” on Parcel 6 (and a lot of screened ground level parking). So, the thing with this is, Carpionato builds lifestyle centers, and although this is more urban-minded than what they get away with in the suburbs (everything is built to the street, there’s no surface parking…) it still reads as fake. Look at the plan above, it is trying to be in a vernacular of something like the Newport waterfront (which is in Newport, not Providence) so it has all these random materials and random angles, and random roof lines in an attempt to replicate the chaotic way neighborhoods like downtown Newport (or let’s be fair and assume they’re trying to replicate Fox Point) grew. But the randomness is so deliberate that it enters some weird uncanny valley of architecture. Which leads to another issue with this, having this many parcels, this wide of a swathe of the urban fabric designed by one developer and one architect feels bad. While these buildings try too hard to look random and built over time, they actually aren’t random enough. Repeating the same handful of surface treatments over three long city blocks, actually ends up creating a sameness which is not a good thing. They just read as one long building with random crap tacked on to them. It would be better to design distinct individual buildings and stop trying to recreate something that never really existed anyway. Create a distinct hotel building, maybe that is red brick. Maybe the residential buildings are cementateous concrete siding, the office building could be more glassy, etc. It isn’t just a slam against Carpionato (though, I really don’t like their architectural taste), having any developer or architect developing all these parcels is not a good idea. Especially as this proposal spans Wickenden Street at an area designated as a gateway area. The attention to design detail of buildings at this location has to be extremely high. I’m not seeing that here. And what we’ve talked about here in the past about Carpionato is the ability to complete. They’ve proposed a similar project at this location in the past and the 195 Commission said no, they have a proposal for the Fruit and Produce Warehouse site that is going nowhere, Chapel View isn’t actually done yet… The 195 Commission should not allow them to purchase all of these parcels unless they can prove that they can get something done in one shot. Commission rules do not allow phased projects (though, Wexford is phased, so…). We cannot allow a developer to sit on parcels if there are others who might be able to get them developed. Besides the routine architecture, the name seems a little odd. Wickenden Street is the retail spine of Fox Point and on the southerly side of the neighborhood, and doesn’t touch College Hill. The Carpianato Group must believe that Fox Point is low brow. The uniformity of the haphazard architecture is in the same vein as Providence Place Mall, as well as some of the more Disney-esque waterfront areas in Newport. Perhaps they could be coaxed to improve the design. If they have the money and can actually built it–mazel tov! A 30,000 square foot restaurant! Total bananas. The 70 room hotel isn’t much bigger. Has to be an error. The biggest Cheesecake Factory in Texas isn’t 30,000sf. Carpionato is a less than reliable developer. The propose a lot and produce little. Lots of film-flam. The commission needs to proceed cautiously and with maximum due delligence or this could, in the end, result in a very modest use of these prime parcels. 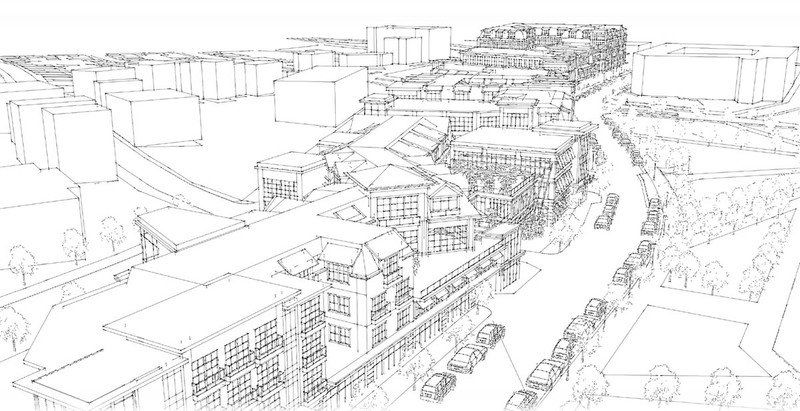 I hope one of the other developers ultimately create an urban 4-6 story residential (condo) – retail complex proposal. I’m thinking that 30,000 square foot restaurant has to include banquet/event space, and possibly a larger than average lounge-type area. It would be a Chapel Grille so it would include banquet space. I like the proposal overall…..but maybe slightly prefer the Spencer proposal, especially for Parcel 5. I think Carpionato’s plan for Parcel 6 is great – office/lab space plus a much needed market! Maybe if they don’t move further ahead on Parcels 2 & 5, they can still build that one?! Pete, I agree with you on parcel 6 – I just wish they could find a way to give the market some frontage on Wickenden, as most of it’s customers would be walking from that direction. Parcel 6 is just terrible at the ground. The market is set away from Wickenden on the part of South Main Street that is effectively an off-ramp from 195. And then there’s office fronting Wickenden. Then a whole bunch of parking, the renderings show that as screened, but it is all just blank storefront along South Water Street. The way the parking is oriented, it looks to be looking for customers coming off the highway from Seekonk, not people who live in Providence. It should be oriented to enter off South Water and exit onto South Main, so the supposed customers, from Providence can get to it and from it from their homes. In fact, I imagine RIDOT would not allow any parking access to/from that area of South Main because they do view it as an off-ramp. Parking entrance off of Peck might be the best and only available solution. The market has to be flipped to front Wickenden, it doesn’t make any sense to tuck it in the back. One could speculate this market being a Trader Joe’s (I have no information to say that is so, it is pure speculation). 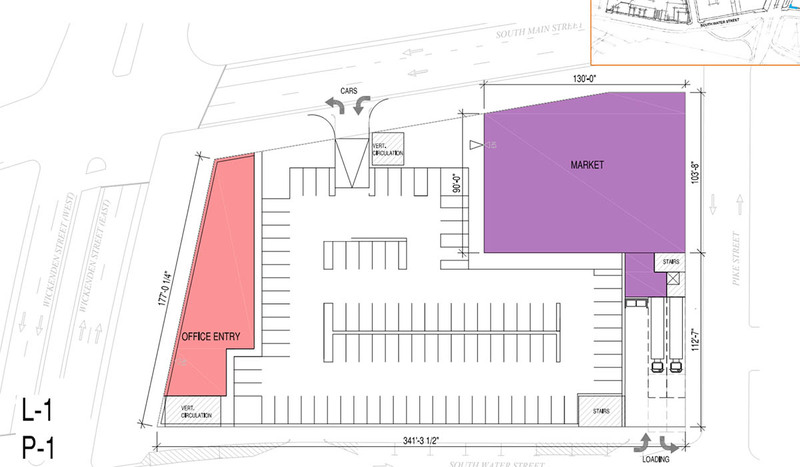 Trader Joe’s has long said they would come to downtown Providence, but they want 75 surface parking spaces. This seems to be the best way to go about accommodating that. Yeah, the parking access from the 195 offramp / South Main Street doesn’t even pass the straight face test. Also, office and lab space on Wickenden Street? WTF? From what I hear, Coro Center in the Jewelry District has gobs of available office and lab space. The office market in central Providence is still really soft and adding a big new office building makes no sense. Just another reason Carpionato can’t be taken seriously in this town. I hate to be the negative one here, but I would expect that the Commission will select this proposal because the pressure is on to sell all the parcels to pay the bond payments that are coming due. This is an opportunity to sell 3 parcels. They have plenty of suggestions to make on design changes, but selling 3 is better than selling 2. Do we really want to be that naive to think that Carpionato doesn’t know this? They basically dusted off a previous proposal and updated it. Also, Carpionato can’t be naive enough to think that the Commission isn’t going to require them to build on a tight timeline, and answer questions related to all the other dead proposals that they’ve made over the years. Including the One Harris Ave. proposal that just disappeared altogether. What makes this any different? I’d hope that the Commission would require milestones to be met that had actual financial consequences. Such as beginning the tax stabilization agreement from the time the P&S is signed. This developer can’t be trusted to follow through on their promises. Carpionato is currently transforming South Attleboro though. Some very nice renovations/new construction. This development feels Garden City esc. Sigh… The Carpionato Group. Looks like their work. I have to agree with “this wide of a swathe of the urban fabric designed by one developer and one architect feels bad”. I heard Trader Joes too and the lab space would be affiliated with Brown but unsure if they would need the entire space or not. Exactly my intuitions ‘re. the random-but-not feel of the architecture. It’s gross and weird. Peter is right that it’s like the PPM, but this is worse. This is stuck somewhere between trying to look oldish and traditional but also newish and modern. It doesn’t work either way … and it definitely tries too hard. Also my feeling about relying on one developer for all three parcels. Risky … especially given that the developer would be Carpionato. With the 195 land is it only the commission that Carpionato has to get approval? I believe that when the city does an approval for a site that involves a demolition that now they require a developer to have full design drawing set ready to apply for a building permit, so that the developer has more financial skin in the game. I believe the DRC has been acting as the design review for the 195 Commission. Although, I’m not sure if these parcels fall under DRC jurisdiction, maybe the CPC acts as design review?